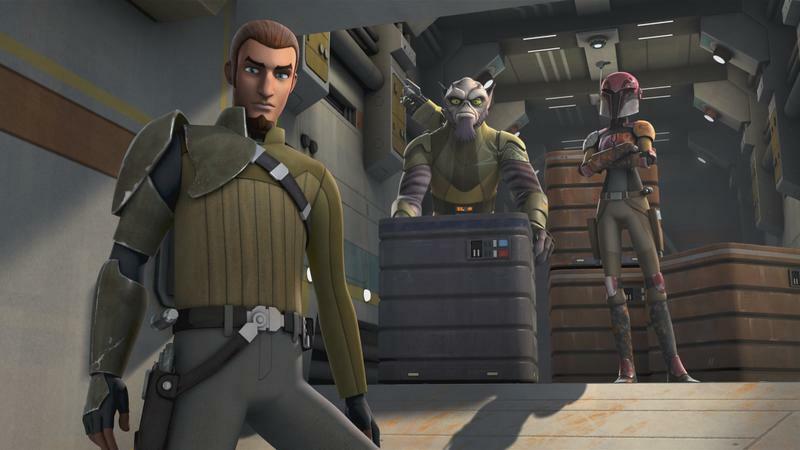 Star Wars: Rebels is the newest animated series set in the Star Wars Universe, and the first new project since the announcement that the Expanded Universe was being reset. When Lucasfilm announced it was retooling the Expanded Universe it declared the six films and the Clone Wars cartoon as canon, along with the upcoming Rebels. Seeing as today is Star Wars day (May the 4th Be With You), it seemed like a good a day as any to launch the first full trailer for the series which will premiere on Disney XD in the fall. The new series will take place during the time span between Episode III: Revenge of the Sith and Episode IV: A New Hope. It will introduce a whole new slew of characters for us to familiarize ourselves with. C1-10P (aka Chopper) – A grumpy astromech droid. He was crafted from spare parts since his masters could not afford anything new. His personality is agitated, cantankerous and stubborn. Ezra Bridger – a charismatic 14 year old con artist, thief, and pickpocket living on the Outer Rim World of Lothal as the Empire strip mines the resources of his homeworld for Sienar's TIE fighter production. He is just starting to learn how to use the Force through Kanan's tutelage. Stealing to survive, he has no real loyalty to anyone. Hera Syndulla – A Twi'lek who pilots the Ghost. Kanan Jarrus – A renegade Jedi who survived the Great Jedi Purge. Thus he keeps his lightsaber under lock and key and brandishes a blaster instead to avoid the attention of the Empire. He is commander of the freighter "Ghost" and is highly eager to fight against the Empire. He is sarcastic but also distraught over the destruction of his culture and former way of life. Sabine – A female Mandalorian with expert knowledge of weapons and explosives. She is also a graffiti artist who tags Imperial facilities with anti-Imperial propaganda after an attack. Zeb Orrelios -Alien sidekick known for his physical strength. Imperial Inquisitor – A Pau'an, the main antagonist and Dark Side user tasked by Darth Vader to hunt down the remaining Jedi left in the galaxy. The series is going to be borrowing heavily from a lot of the original concept artwork Ralph McQuarrie did for the original film – Chopper looks like the original art for R2-D2, Zeb looks strikingly like the art for Chewie – and will be handled by many of the same people that worked on the critically acclaimed Clone Wars series. Check out the trailer below and let us know if you're looking forward to Star Wars: Rebels when it premieres this fall.